Stanford Advanced Materials (SAM) provides high quality nickel powder used for thermal spraying coatings. Related products: Copper Powder for Thermal Spraying, Molybdenum Powder for Thermal Spraying, Aluminum Powder for Thermal Spraying, Silicon Metalloid Powder for Thermal Spraying, etc. 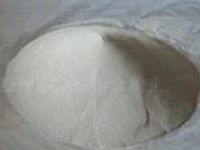 Nickel powder for thermal spraying coatings is widely used in industries. The pure nickel coatings are hard, dense and readily machinable.